Robert J. Cabin uses the restoration of tropical dry forestland in Hawaii as an in-depth case study to investigate the scientific, practical, and philosophical issues associated with performing ecological restoration in the messy real world. Interweaving entertaining narratives of his own on-the-ground experiences as a practicing restorationist with reflections about his scientific training and background, Cabin explores the relationship between science and practice in ecological restoration. He observes that because restoration can be complex and value-driven, its implementation often turns out to be as much interdisciplinary art as hard science. Despite the often distinct cultures and methodologies of scientists and practitioners, Cabin shows how each has a vital role in effective restoration and offers suggestions for improving working relationships. One approach he advocates is what he calls "intelligent tinkering," after the work of Aldo Leopold. In this model, practitioners employ the same kind of careful but informal trial-and-error strategy followed by such groups as indigenous peoples and hobbyist mechanics. Cabin illustrates the power of intelligent tinkering using examples from his own work and other restoration projects. The gap between science and practice is not unique to ecological restoration; it is a widespread problem across all fields of applied science. 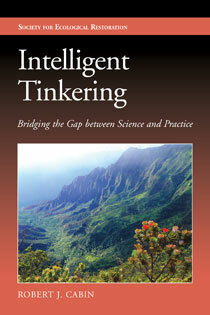 Written in a clear and engaging style, Intelligent Tinkering offers an insightful look at the underlying causes of the problem, along with invaluable suggestions for addressing it. "I found this book an informative, interesting, and useful introduction to restoration work in Hawaii and beyond. In fact, it is an excellent and easy read for students and served as a valuable resource in my own graduate course." "...should be required reading for any undergraduate embarking on a career in ecology, and perhaps for anyone interested in carrying out scientific experiments, whatever the discipline." "I found this book to be engaging, honest, and valuable. I recommend it." "This excellent book ends on a suitably positive note by giving three examples of successful restoration projects in Hawai'i that have adopted the flexible approaches Cabin advocates. The lessons learned from Cabin's time in Hawai'i are well worth a read to anybody interested in developing an integrated approach to conservation science and practice." "Professionals, volunteers and academics seeking to combine their efforts will benefit from the variety of perspectives that Cabin brings to light." "Intelligent Tinkering is full of wisdom, honesty, and the voice of experience...Readers would be hard pressed to find a better, more compelling guide to help them navigate these heretofore poorly charted waters." "This book will set the tone for ecological restoration for years to come. It's not so much about Hawaii as it is about the imperative to resolve differences between the science of ecological restoration and its practice. It addresses ambiguities that we prefer to ignore regarding conservation. The book is a compelling personal account by Bob Cabin, who has serious credentials as a scientist and practitioner. Filled with imagery and insight, the book has the flair of a best-selling novel." "Cabin offers rare, poetic insight into his experiences restoring Hawaii's dryland forest and the tension that exists between the science and the practice of ecological restoration. His plea for intelligent tinkering acknowledges that success requires good science but also good practice and local knowledge. This book will add spice to the debate about how best to do ecological restoration. No matter what perspective one has, everyone concerned about the fate of degraded ecosystems and the factors that drive restoration success should read this book." "One of the attractive features of this book is that it is a very personal narrative, and Cabin does not spare himself in his assessment of the value (or otherwise) of formal research."